Did you know you can use tea as a flavouring in all sorts of cooking? These vegetarian jellies are simple to make and you can use all sorts of fruit, whatever is in season! Make a rooibos (redbush) tea with 3tsp loose rooibos tea or redbush tea and 300ml hot water. Infuse for 5 minutes. Put the sugar and lemon juice into a sauce pan, than strain the rooibos tea on top. Stir to dissolve the sugar, if the sugar doesn't dissolve, just gently heat the mixture until it does. Once completely cooled down, add the vegetarian gelatine and bring to a boil, while stirring continuously. 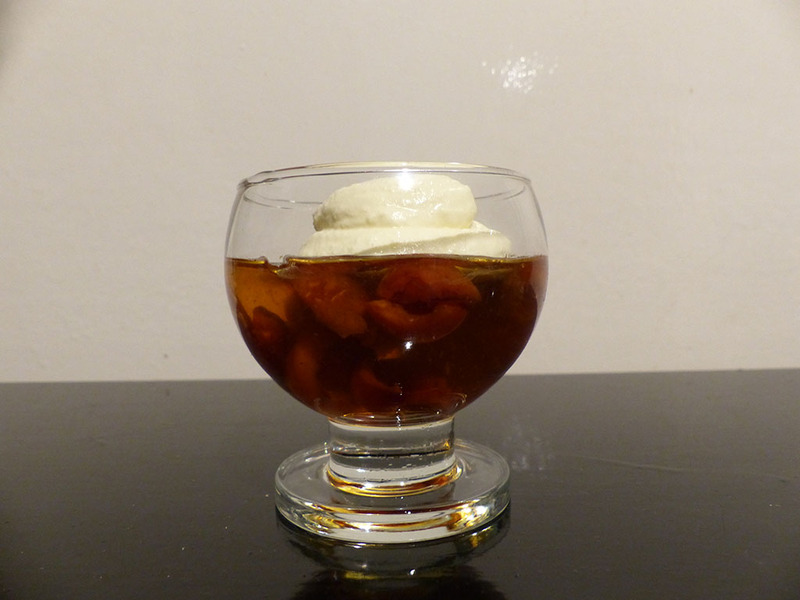 Divide the cherries (or other fruit) in 4 dessert glasses or bowls, add the jelly and leave to set. This might take up to an hour! Whisk the double cream with the rose water while slowly adding the icing sugar. Add the rose water flavoured cream on top of the vegetarian cherry jellies!